한국어 사용자 분들을 위한 글 입니다. I went to Hongdae (Hongik University district in Seoul) and everyplace swarmed with people. There are a variety of shops, cafes, restaurants and small galleries in Hongdae area so I sometimes visit there to see what’s going on. (because cafes and shops are changing frequently) And on the street, I found so many street stalls are selling ‘mobile phone cases’ with various designs and characters. People in Korea keep changing their mobile phones cases because they think the cases are one of fashion accessories. So if you’re in Korea, especially in Seoul you can see many street stalls that sell mobile phone cases. I read several journal articles before that are about the relationship between mobile phone accessories and personality. And I also agree that those mobile phone accessories are certainly showing every personality. So it might be interesting to investigate how different mobile phone cases characterise each person. (and what differences between different countries, culture, gender and etc.) 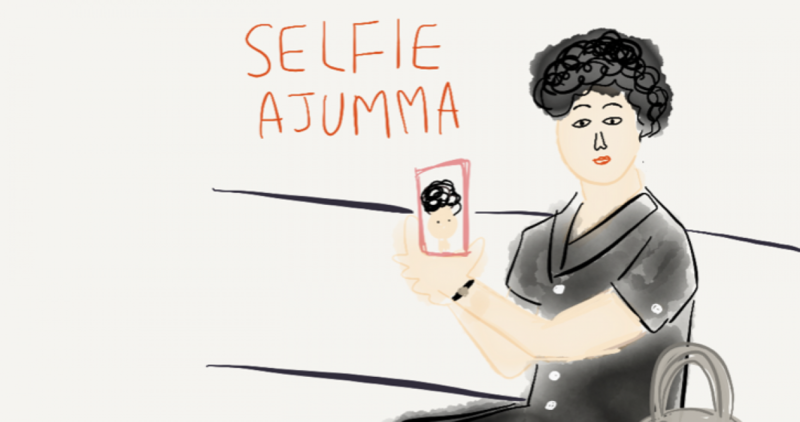 And there will be ‘Ajummas’ favourite mobile phone cases, too!!! Mangchi Ajumma, Emily Kim is a famous YouTuber who cook Korean food. She immigrated to the U.S. in 1992 with her family. She was almost addicted to computer gaming and spent her time at home after coming back from work. One day, her family recommended her spend time productively such as producing a cooking video rather than just playing computer game all day. So she started produce Korean food cooking video on YouTube and the number of subscribers of her channel are increasing dramatically. She also published a cookbook that is titled ‘Maangchi’s Real Korean Cooking‘. And there is her own website, ‘www.maangchi.com‘. (You can watch all the Maangchi ajumma’s Korean cooking videos, information about Korean ingredients, (ingredients glossary) and any other useful information related to Korean culture, especially Korean food culture)). I really want to interview this lovely maangchi ajumma someday soon. This is very exciting example of smart ajumma, I can tell. 내 뒤의 할머니는 병원안에서 할아버지를 잃어버렸고, 할아버지를 찾아달라며 안내데스크에 부탁했다. 얼마 지나지 않아서 보안업체 직원이 할머니곁에 와서 할아버님의 인상착의에 대해 여쭤봤다. 그렇게 시간이 얼마 되지 않아 정말 할아버님을 모시고 또 다른 보안업체 직원분이 오셨다. 정말 다행이다. 이럴때 스마트폰이 참 좋구나. 아줌마는 꼭 언니가 되어야 할까? 아줌마와 비아줌마를 구분짓는 요소는 보통 나이, 결혼유무, 외모등이 있지만 대부분 ‘중년여성 (40대 이상)’의 ‘아줌마같은’외모를 갖고 있는 여성을 우리는 흔히 아줌마라고 부른다. (내 논문에서도 항상 조심스러웠고 아직도 ‘아줌마’를 구분짓는 명확한 법적기준이 정해져있지만…) 하지만 아줌마라는 호칭은 여전히 부르는 사람도, 그 호칭을 듣게되는 상대방도 영 달갑지가 않다. 특히 우리나라 여성들이 되도록이면 피하고 싶은 ‘호칭’이 바로 ‘아줌마’이다. 이러한 분위기 때문인지 몰라도, 아줌마같지 않은 중년여성, 언니같은 중년여성등등 즉, ‘아줌마같지 않은’ 여성은 때로는 아니 많은 경우에 자기관리를 철저하게 하고 있는 ‘멋진 여성’으로 그려지고 있다. 아줌마라고 불리는게 뭔가 큰 잘못을 하고 있는것처럼 묘사하고 있는 몇몇 미디어들도 아직 꽤나 많이 있다. 어제 아침에 우연히 보게된 아침방송은 피부관리에 관한 이야기였다. 피부관리에 관한 이야기를 꺼내기에 앞서서 아줌마에 대한 이야기로 방송은 시작했다. 아줌마와 언니의 기준은 무엇인가?로 시작한 패널들의 이야기는 뭐 늘 그렇듯이 우리가 흔히 아는 ‘아줌마’에 대한 보통 사람들이 생각하는 에피소드들로 재미있게 이어나갔다. 목소리가 크다, 오지랖이 넓다, 등등 보통 우리가 아줌마들을 묘사할때 마다 등장하는 특징들로 아줌마에 대한 이야기는 계속되었다. 젊었을때는 아줌마라고 누가 등뒤에서 부르면 ‘당연히 나는 아니겠지’라는 생각으로 무시하고 지나쳤는데, 어느정도 나이가 들어가니 (40대 이상) 누군가 ‘아줌마!’라고 소리치면 자신을 부르는것 같아서 괜히 그 자리를 피하고 싶고 듣기 싫고 뭐 그런 불편한 마음이 든다고 패널들은 각자의 ‘아줌마’ 호칭에 관한 이야기들을 나누었다. 주민등록증과 같이 정확한 신분을 나타내주는 ‘아줌마 등록카드’가 있는것도 아니어서 아줌마와 비아줌마를 어떠한 기준으로 나눈다는것은 힘든일이고 또한 논란을 야기할수도 있는 것이다. (아줌마 등록카드라는것이 생겨나는것도 이상하고) 그리고 아줌마라는 그룹의 인식이 부정적으로 비추어져왔고, 그러한 분위기는 점점 나아지고 있다고는 하지만 여전히 아줌마라는 호칭을 부르기도, 불리워지기도 껄끄러운 것은 사실이다. 예전의 포스팅에서도 늘 언급했다시피 아주머니는 좀 더 고급스러워보이고 아줌마는 어딘가 낮추어 부르는듯한 느낌이 든다고 대답한 몇몇 설문자들의 대답들도 이해가 가기는 하지만 한편으로는 ‘아니 왜? 둘 다 같은 뜻인데’라는 생각도 하게 된다. 물론 이러한 ‘아줌마’혹은 ‘아주머니’ 호칭에 대해 판이하게 달라지는 반응은 아마도 그동안 우리사회가 얼마나 ‘아줌마’라는 호칭을 부정적으로 사용해왔고 또 생산해냈는지를 알 수 있게 해주는 좋은 예이다. 아무튼, 아줌마가 된다는것, 아줌마로 불리워진다는것 또 아줌마처럼 보여진다는것은 마치 자기관리를 하지않은 사람으로 미디어에서 비추고 있다. 위에서 언급한 한 방송사의 아침프로그램에서 ‘피부노화관리’에 대한 건강정보를 주면서 굳이 ‘아줌마’피부에서 ‘언니’피부로 가는 방법이라고 강조한것만 봐도 그렇다. 뭐 누구나 이해하기 쉽게 ‘아줌마’피부 보다는 ‘언니’피부 (노화가 된 피부와 젊어보이는 피부)가 보기 좋다라고 말하기 위해 ‘아줌마’와 ‘언니’를 사용한것은 알겠지만, 이러한 ‘아줌마=나이든 여자 vs 언니=젊은 여자’와 같은 논리는 이제 좀 벗어나도 되지 않을까 싶은 마음에서 이 글을 쓰게 되었다. 실제로 아줌마들도 피부관리와 같은 미용에 관심이 많은 분들이 엄청나다. 또한 아줌마들의 패션센스와 패션에 대한 관심도 높아서 이미 아줌마들을 주 고객층으로 삼는 브랜드들도 매우 다양하게 존재하고 있다.그런데, 아줌마를 계속 언니의 반대 즉 나이든여자와 젊은여자의 구도로만 보여준다면 아줌마에 대한 인식은 계속 부정적으로 그려지고 받아들여지게 될것이다. 쉽게 변하는것은 없다. 그리고 오랜 시간과 노력이 필요하다는 것도 모두가 알고 있는 사실이다. 아줌마에 대한 우리의 인식도 마찬가지이다. 아줌마라서, 아줌마 이기 때문에 편견을 갖고 그들을 대한다면 안될것이다. 아줌마 이니까, 아줌마 이기 때문에 그들만이 갖고 있는, 우리가 그동안 보지 못했던 그들만의 아줌마스러운 면모들을 찾아보려고 노력해보는건 어떨까. I and my parents love going to 5-day market. 5-day markets (Oiljang Markets) are held every 5 days usually in the countryside of South Korea. In 5-day market, we can buy regional specialities that hardly found in a supermarket in my town. Especially, I love having local foods that local ajumma sellers cook with ingredients from their own farms.They look plain but the flavours of them are too beautiful for words. I can meet so many ajummas in 5-day markets as well. Ajumma sellers bring and sell their harvests in this market to support their children’s education. And ajummas also purchase things they need in this market, too. These 5-day market is similar to the wash place in my PhD research, it is a kind of places where ajummas do social economy activities. Maybe I need to think more about the relationship between a 5-day market and our ajummas. But one thing that I can say is that 5-day market is another women’s place, especially place for ajummas. Merry Christmas to lovely Ajummas!! More blog entries will be coming in 2017!